Sharyland High School Honor Band students, Melissa Vaughan and Ricardo Cuellar. Sharyland High School Honor Band students, Melissa Vaughan and Ricardo Cuellar, were selected to perform in Texas All-State Ensemble in San Antonio this past Saturday at the Henry B. Gonzalez Convention Center as part of the 2018 Texas Music Educators Association Clinic/Convention. 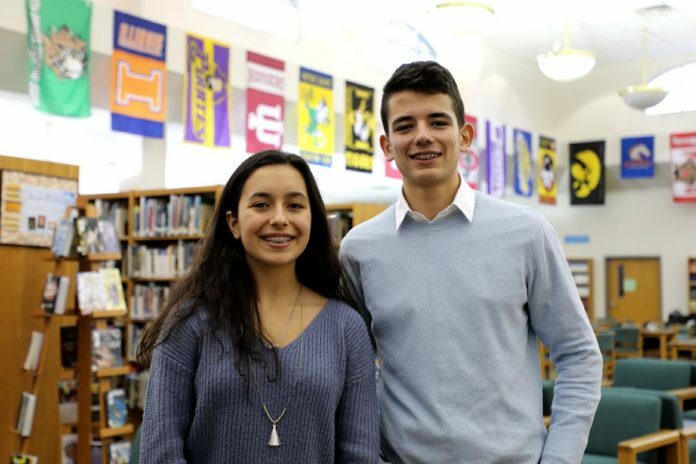 Vaughan and Cuellar were chosen for their prestigious honors through a competitive process held this year across the state at district, region and area levels. “This is my second year auditioning for the TMEA All State band. For the past six months I have been practicing three etudes at least two hours per day. Its nerve wracking to know that one mistake could mess everything up. I didn’t expect to make State because at the area level everyone is so good, but it’s gratifying to know that hard work pays off,” Vaughan said. Vaughan plays at school under the direction of Neil Nelson who is a member of the Texas Music Educators Association, a 19,000-plus-member organization headquartered in Austin. This is Vaughan’s first time to perform as a member of a TMEA All-State organization. “As an all-state musician, the process to get me to where I am was tedious to say the least. It was my first year auditioning for a chair in the state and I have to say that I will definitely be trying out once again my senior year. The amount that I’ve grown as a musician and as a person is incredible and I owe it all to the all-state audition process.” Cuellar said. He is a student of Frank Salinas and plays at school also under the direction of Nelson. This is Cuellar’s first time to perform as a member of a TMEA All-State organization. High school students selected to perform in the All-State concerts have competed through auditions to qualify at the state level. All-State is the highest honor a Texas music student can receive. Only 1,780 students are selected through a process that begins with over 70,000 students from around the state vying for this honor to perform in one of 15 ensembles (bands, orchestras and choirs).